Roma cut Juventus's lead in Serie A to five points as Mattia Destro's hat-trick gave them victory at Cagliari. Roma, who led the league this season after winning their first 10 games, went 1-0 up in the 32nd minute when Destro tapped in from Gervinho's pass. He added a second with a low strike before slotting in the third following more good work from Gervinho. Chile striker Mauricio Pinilla scored Cagliari's goal from the spot after he was fouled by Mehdi Benatia. Destro has now taken his tally to 13 for the season, five behind Juventus striker Carlos Tevez and Torino's Ciro Immobile, who are tied on 18. Sunday's victory moves Rudi Garcia's side to 76 points from 32 games, with six games of the season remaining. Juve, who have a game in hand, host Livorno on Monday at 18:00 BST. Match ends, Cagliari 1, Roma 3. Second Half ends, Cagliari 1, Roma 3. Offside, Roma. Michel Bastos tries a through ball, but Mattia Destro is caught offside. Foul by Michel Bastos (Roma). Víctor Ibarbo (Cagliari) wins a free kick in the defensive half. Attempt missed. Mauricio Pinilla (Cagliari) right footed shot from the left side of the box misses to the right. Assisted by Sebastian Eriksson. Michel Bastos (Roma) wins a free kick in the attacking half. Foul by Sebastian Eriksson (Cagliari). Goal! Cagliari 1, Roma 3. Mauricio Pinilla (Cagliari) converts the penalty with a right footed shot to the centre of the goal. Penalty conceded by Mehdi Benatia (Roma) after a foul in the penalty area. Penalty Cagliari. Mauricio Pinilla draws a foul in the penalty area. Attempt saved. Daniele Dessena (Cagliari) right footed shot from the right side of the box is saved in the bottom left corner. Assisted by Francesco Pisano. Attempt missed. Davide Astori (Cagliari) header from the centre of the box is too high. Assisted by Agim Ibraimi with a cross following a set piece situation. Substitution, Roma. Michel Bastos replaces Radja Nainggolan. Attempt saved. Danilo Avelar (Cagliari) left footed shot from outside the box is saved in the centre of the goal. Assisted by Daniele Conti. Foul by Leandro Castán (Roma). Attempt saved. 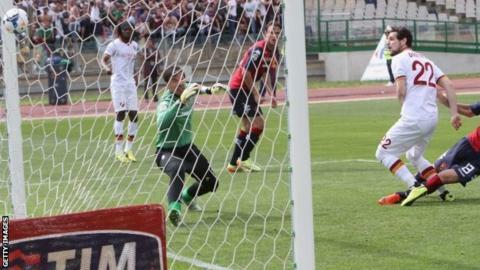 Víctor Ibarbo (Cagliari) header from the centre of the box is saved in the centre of the goal. Assisted by Agim Ibraimi with a cross. Substitution, Roma. Rodrigo Taddei replaces Miralem Pjanic. Goal! Cagliari 0, Roma 3. Mattia Destro (Roma) right footed shot from the centre of the box to the bottom left corner. Assisted by Alessandro Florenzi with a through ball. Attempt blocked. Víctor Ibarbo (Cagliari) left footed shot from the right side of the box is blocked. Assisted by Daniele Dessena. Daniele Conti (Cagliari) wins a free kick in the defensive half. Leandro Castán (Roma) wins a free kick in the defensive half. Corner, Roma. Conceded by Danilo Avelar. Delay in match Mehdi Benatia (Roma) because of an injury. Attempt saved. Mauricio Pinilla (Cagliari) right footed shot from outside the box is saved in the centre of the goal. Assisted by Daniele Conti. Substitution, Cagliari. Víctor Ibarbo replaces Nenê. Goal! Cagliari 0, Roma 2. Mattia Destro (Roma) right footed shot from the centre of the box to the bottom left corner. Assisted by Radja Nainggolan with a through ball following a fast break.